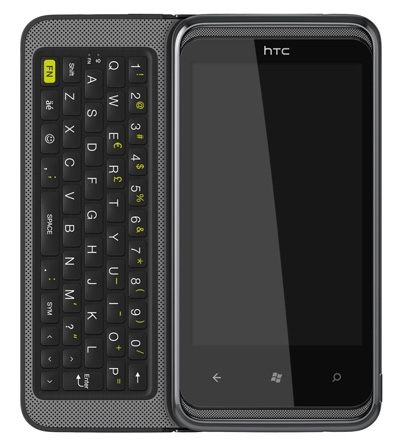 HTC's HD7 Pro is the first landscape slider model in the WP7 line-up, and is due to hit the streets in Germany next week. Unlike the pic above, O2 Germany's version will sport a QWERTZ keyboard, and will be offered for €22 with two year contract, or €599 unlocked. Here's hoping the rollout goes global soon. It's funny, I used to always SWEAR I needed a keyboard on my phone, but the on-screen keyboard in WP7 is so good that I never use the slide-out keyboard on the LG Quantum I'm using. Never thought I'd say that! The keyboard is one of the best thing of WP7 indeed; very accurate and easy to use. OK, I was going to make a comment that this isn't really the 'first' landscape keyboard slider for WP7 since the LG Quantum beat them to the punch, but Jason subtlely beat me to the punch. On my LG, I find I'm using the keyboard quite a bit -- especially for longer responses. The touch keyboard is OK for shorter messages, but when I have a couple of sentences on my mind, the keyboard is more accurate and quicker for me. Same here. I was very disappointed that at launch I couldn't get a WP7 device with hardware keyboard and now I'm very happy with WP7's on-screen keyboard. Even on my LG Optimus 7 with it's 'small' screen (compared to other WP7 phones) and portrait orientation I find typing to be very easy. I would still prefer a hardware keyboard but probably not the price that comes with it (both money and added bulk).